The second Sonny Baca novel is not just a sequel, but a continuation of a journey through the four seasons and the four sacred directions that began in book one, Zia Summer. Sonny, the great-grandson of legendary New Mexico lawman Elfego Baca, grows as heir to his bisabuelo’s role and also in his spirituality and capacity for love. To recover from the soul sickness caused by a murder he dealt with in the first book, Sonny seeks healing from a curandera. The healing is his initiation into the spirit world and shamanic experiences, and it introduces the most compelling aspects of the story. This private investigator character far from noir. Sonny is colorful, a flawed but basically virtuous young man strongly connected to his family, culture, and community. He’s realistic in many ways and yet also a larger-than-life hero who has mythic-scale adventures in his archetypal battle with Raven, the cult leader and domestic terrorist he pursued in the first book. 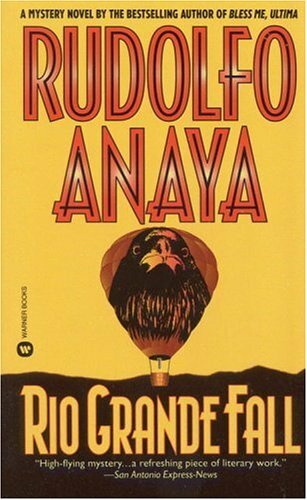 Sonny is hired by the Alburquerque International Balloon Fiesta when a balloonist who could have been a witness in a case involving Raven dies. (Get use to that extra r in Albuquerque as you read the series. It’s not a typo. Anaya restored it, though it fell off the city’s name a long time ago.) An intriguing aspect of the crime plot is the time period, in the aftermath of the Iran-Contra scandal and the arms-and-drugs deals of that era. One of the themes is corruption. The balloon fiesta itself, the city’s diverse neighborhoods, and the glory of October in New Mexico, are as central to the story as the characters. The author is so passionate about them he gets carried away sometimes, re-describing them more often than necessary. He also restates his themes a bit too often. I guess his editor didn’t dare tell the master cut, but these repetitions slow the pace. A reflection on autumn in the Rio Grande valley isn’t needed when lives are at stake. The book overall is still powerful. I mean this as praise when I say it has an occasional comic book quality—a fight scene with a leap off a balcony, a mad scientist scene, the invocation of special powers—because myths, archetypes, and superheroes are closely related. The most complex characters aren’t the good ones or the evil ones, but two women who are torn between: Madge, the balloon fiesta director, and Tamara, Raven’s former follower. The Good Women aren’t filled out as well. Though their roles in Sonny’s life differ, his lover, Rita, restaurateur and herbalist, and the curandera, Lorenza, are virtually identical. This may be due to Sonny’s idealization of them—or the author’s. Lorenza is Sonny’s new spiritual teacher. His neighbor don Eliseo, a traditional elder, was his teacher in the first book and remains one in this. I’ll be interested to see if each book in the series adds another teacher and how these teachers balance his spiritual wholeness by the end. Despite some excess verbiage, I’ll follow the rest of the series. After all, it’s excess verbiage by Anaya.